The Blue Jays had a clean sweep yesterday, winning 3-0 over the Philadelphia Phillies and having all four active minor league teams win their games thanks to some great pitching performances. With Austin Bibens-Dirkx on the hill, the Bisons rallied early and often to support the man making his first Triple-A start of the year. ABD went four strong innings, allowing two runs on five hits and a walk with five runs. Ryan Rowland-Smith made his first Blue Jays’ appearance allowing a run on two hits over his two innings while Gregory Infante and Bobby Korecky mopped things up with three scoreless between them. The offense didn’t really explode and capitalize on opportunities. Matt Tuiasosopo drove in three with a double in the ninth while Dan Johnson drove in another two runs, going 1/3 with two walks. Kevin Pillar was on base five times, going 3/3 with a triple and two walks while Anthony Gose stole a pair of bases, going 2/5. Despite getting beaten repeatedly by the Mets earlier in the season, the Fisher Cats had Casey Janssen starting on the hill in a rehab start before Scott Copeland took over. 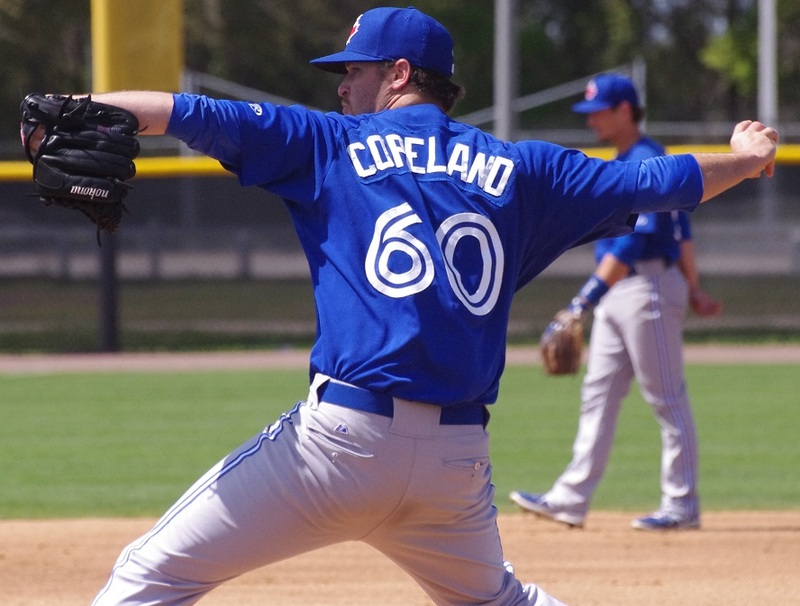 Janssen faced five batters, allowing two hits before being able to retire the side and Copeland was outstanding, pitching eight scoreless innings, allowing four hits and a walk while striking out three. Andy Fermin, one of this season’s biggest roster surprises, hit his first Double-A home run, going 1/2 with a walk and is hitting .393 in limited playing time. Brad Glenn went 2/4 with a double and Jon Berti stole his 12th base of the season, going 2/4. A.J. Jimenez is quietly hitting .317 after going 1/4 with an RBI double. The Dunedin Blue Jays got some great pitching and put up two runs in four different innings to beat the Tampa Yankees. Daniel Norris started and was dominant, striking out 10 batters in just 4 2/3 innings, giving up five hits and three walks but no runs. Blake McFarland earned the win but gave up two runs in 2 1/3 innings while Danny Barnes allowed the third run. Chad Girodo still hasn’t allowed an earned run on the season, pitching another scoreless inning to finish the game. Another Jay was rehabbing: this time it was Adam Lind who went 3/5 with two doubles for the D-Jays. Dwight Smith went 3/5 with a triple, Marcus Knecht went 2/4 wtih a double and a triple while Jorge Flores and Christian Lopes each had a pair of hits. Tom Robson had his best start of the season for the Lansing Lugnuts, facing only two batters over the minimum over six strong innings, allowing only one run on two hits with eight strikeouts. Dawel Lugo had a 3/4 day while D.J. Davis had another two hits (including a double) but was caught stealing for the fifth time this year. Hope you’re up early: there are a couple of early games today in the Jays’ organization! The Bisons take on the Gwinnett Braves today at 6:35 PM ET (catch it on MiLB TV) with Liam Hendriks against Ian Thomas. Hendriks has been dominant, posting a 1.26 ERA with just one walk and 26 strikeouts this season in 28 2/3 innings. Thomas has been recently send down from the majors, posting a 4.26 ERA with 2 walks and six strikeouts in 6 1/3 big leauge innings. Despite his jump to the majors, Thomas is making his Triple-A debut. In the second game of their series, the Fisher Cats sent Matt Boyd to the hill for his second Double-A start of the season against Hansel Robles. We all know about Boyd’s fantastic start for the Dunedin Blue Jays and he only went four innings in his last outing against Trenton, allowing two runs on five hits and one walk with four strikeouts. Robles has a 2.21 ERA in four starts with 20 1/3 innings under his belt. He’s had trouble with control, allowing 11 walks but has struck out over a batter per inning with 21. Catch the game on the internet and radio at 6:35 PM ET. For the early risers among you, the Dunedin Blue Jays play the Tampa Yankees at 11 AM ET. The D-Jays have seen Brad Gerritse once before, in his last start and they didn’t have a solution for him. Gerritse, 23, allowed just two hits and two walks over six innings against Dunedin although his season numbers aren’t that strong. For the D-Jays, Kendall Graveman takes the hill. Graveman, like Boyd, was dominating in the first part of the year but ran into some trouble in his first High-A game after his promotion. He gave up four runs (two earned) in four innings on eight hits and a walk but is looking to make some adjustments in his second outing for Dunedin. In another early game (10:35 AM ET), the Lugnuts send Shane Dawson to the mound for his second outing of the season. Dawson, a 20-year-old lefty, hit a rough patch, walking five in his first outing of the season after joining the Lugnuts from extended spring training and is looking to get back on the right foot. Kyle Lloyd is a 23-year-old righty who has been pretty good out of hte bullpen so far this year with a 2.84 ERA, five walks and 18 strikeouts in 12 2/3 innings. He makes his first start of the season against the Lugnuts.